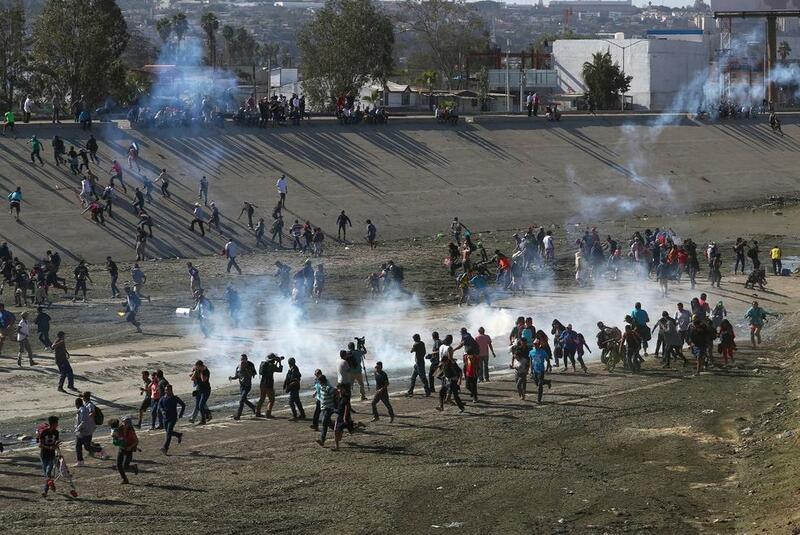 Mexico Calls For Investigation Into Tear Gas Use At U.S. Border, Why? Amidst rising tensions at the border with the migrant caravans slowly making their way to the U.S., President Trump said Monday morning he would close the border "permanently" if he has to. The situation at the border is coming to a boiling point as "mayhem" broke out at the U.S.-Mexico border pedestrian crossings at the San Ysidro port of entry prompting it to be closed by officials. Customs and Border Protection Commissioner Kevin McAleenan said the move "prevented a dangerous situation from getting worse". Many of the migrants carried flags of their native countries making the mass attempt at illegal entry appear more like an invasion. Liberal pop singer Rihanna called the defense of our country's borders with non-lethal means "terrorism". That is how backward the ideology of the far left has become. The San Ysidro port of entry is one of the busiest and operations were suspended Sunday by Customs and Border Protection as U.S. Border agents fought to keep migrants at bay using tear gas. A few even tried to breach a fence but were met with force by border agents and now Mexico's foreign ministry presented a diplomatic note to the U.S. government Monday calling for "a full investigation" into the non-lethal weapons. The port of entry was reopened by Sunday evening but the President has made it clear that he is not going to admit asylum-seeking migrants waiting for entry who have already been offered asylum by Mexico. Trump offered a warning to Mexico if they did not keep the migrant caravans from attacking the border. "Mexico should move the flag-waving Migrants, many of whom are stone cold criminals, back to their countries," the President said on Twitter. "Do it by plane, do it by bus, do it any way you want, but they are NOT coming into the U.S.A. We will close the Border permanently if need be. Congress, fund the WALL!" The President is doing what Americans elected him to do, which is to enforce U.S. law and stop the flow of illegal immigration at the porous border. He also called for Congress to complete the installments of $1.6 billion dollars needed for the remaining sections of the border wall yet to be completed. Politico tried to refute the President's claims that criminals were among the caravans but even the U.S. Department of Homeland Security issued a warning that there were dangerous criminals and gang members among the groups. Regardless of who is in the caravans, the migrants seeking to gain illegal entry are seen as invaders and are being lawfully repelled using human means. If this were Israel, the border guards would be using lethal force but let's hope a peaceful resolution can be reached with Mexico and no American lives are lost in the process. Has any single Democrat considered the fact that once migrants enter the country illegally the only way for them to work is also illegally, many of whom will purchase stolen American identities to obtain welfare benefits? This is America, we require people to enter the country through legal means. Terrorists?! This tdstard would have her security shoot anyone of those animals trying to break into her home! And it’s not different, this is our home they are trying to force their way into.